When I first read those seven verses I said to myself, “Could it get any worse for that man?” After all full of troubles, as good as dead, no strength, left alone, forgotten, cut off, thrown into the darkest depths, God’s angry at him, how could it get any worse? I don’t know about you but I sure wouldn’t want to be in his shoes. Or would I? As negative and as dark and troubled as his life appears to be he walks in the Light! A person who is about to roll over and die does not pour their hearts out to God. Or if they do their prayer might go something like this, “Thanks for nothing God.” A person who prays, “O Lord, God of my salvation, I cry out to you by day. I come to you at night. Now hear my prayer; listen to my cry,” has no intention of rolling over and dying. I know that for a fact because I’ve been that person. And I suspect at some point in your life you can say the same thing. This morning’s scripture could have been written by King Hezekiah after Isaiah told him he was going to die. 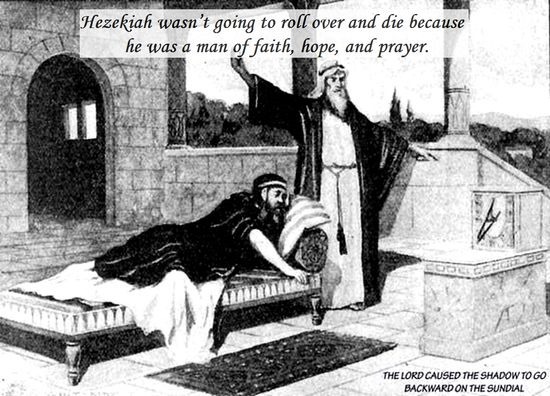 But Hezekiah wasn’t going to roll over and die because he was a man of faith, hope, and prayer. Hezekiah prayed, “Remember, O Lord, how I have always been faithful to you and have served you single-mindedly, always doing what pleases you.” Then he broke down and wept bitterly.” (2 Kings 20:3, NLT) And God opened up His heart healed Hezekiah and gave him another 15 years of life. I know this is nothing new to you so just take it as a friendly reminder. Prayer is more than just uttering words, when someone prays God opens His heart and invites them in. Prayer is faith and hope in action. The greatest blessing of prayer isn’t what we get it’s the kinship with God. One last thought. Psalms 88 begins with an affirmation, “O Lord, God of my salvation,” the Psalmist knows no matter what is happening to him God is going to make it better!